Photo: Heather Roberge: En Pointe on view at the SCI- Arc Gallery. Photo by Joshua White, courtesy of Heather Roberge. Heather Roberge: En Pointe examines the historical and spatial significance of the column. We asked Roberge, founding principal of Murmur: Architecture and Environments about the evolution of her architectural investigations. The installation is on view at the SCI-Arc Gallery through August 2. 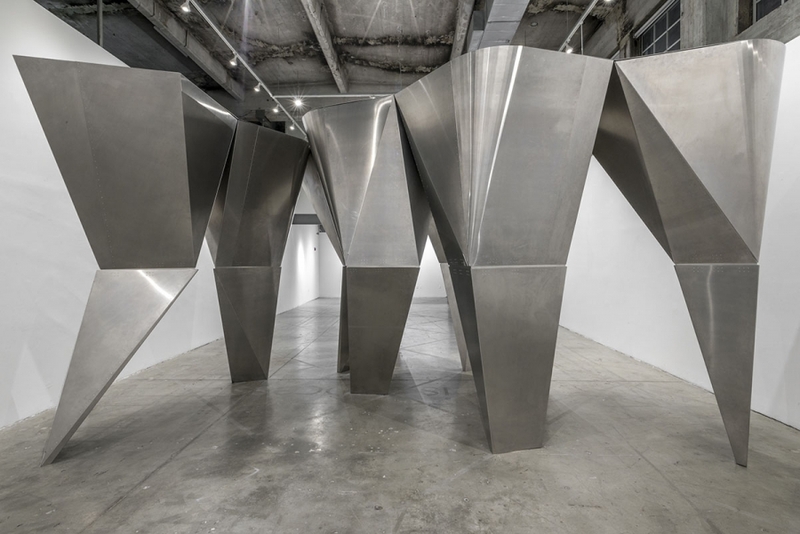 En Pointe addresses structure’s ability to be both an object and series. What were your precedents in studying this relationship? Initially we looked at the Egyptian hypostyle hall and its use of closely spaced, massive columns to define highly figural interstices between columns. While not central to the column’s work at the time, the hypostyle columnar series inadvertently stumbled upon the production of space. We expanded this initial research studying ten historical periods to understand the development of the column and its disciplinary significance. The surface-active columns of Felix Candela at Iglesia de la Medalla Milagrosa and Mies van der Rohe’s cruciform columns influenced En Pointe. The most recent work studied was Japanese contemporary architecture. We analyzed technically innovative columns in the work of Junya Ishigami, Toyo Ito, and Sou Fujimoto. What were the structural challenges? Surprisingly, the engineering was rather straightforward. Our initial column series was determined using an open source video game engine called Unity. Its physics engine accurately simulated the effects of adjacent columns leaning on one another for stability. Using this tool, we were able to calculate the center of gravities of the individual columns and predict the resultant forces of small sets. The geometries were constrained very early on by my desire to build the columns as aluminum shells without an interior frame. The column’s surface carries the self-weight of the object and partial loads from its neighbors. Our structural consultant, Matt Melnyk of Nous Engineering, ran analysis models to determine the aluminum thickness required and to assess the accuracy of our early simulations. Working together we determined the details necessary for assembly and erection without scaffolding. The most challenging part of the project was the integration of manufacturing constraints into our digital model. This allowed us to produce accurate unfolded patterns for laser cutting and forming.